Castillo, Marigold and Weiselberg, Eric 2017. Bulimia Nervosa/Purging Disorder. Current Problems in Pediatric and Adolescent Health Care, Vol. 47, Issue. 4, p. 85. Demos, Vasilikie and Segal, Marcia Texler 2016. Gender and Food: From Production to Consumption and After. Vol. 22, Issue. , p. xiii. Frampton, Ian 2013. Russell (1979): bulimia nervosa - an ominous variant of anorexia nervosa. Advances in Eating Disorders, Vol. 1, Issue. 1, p. 103. 2010. Treatment of Eating Disorders. p. 459. Agras, W. S., Walsh, B. T., Fairburn, C. G., et al (2000) A multi-centre comparison of cognitive–behavioural therapy and interpersonal psychotherapy for bulimia nervosa. Archives of General Psychiatry, 57, 459–466. American Psychiatric Association (1980) Diagnostic and Statistical Manual of Mental Disorders (3rd edn) (DSM –III). Washington, DC: APA. American Psychiatric Association (1987) Diagnostic and Statistical Manual of Mental Disorders (3rd edn, revised) (DSM – III – R). Washington, DC: APA. Fairburn, C. G. (1997) Interpersonal psychotherapy for bulimia nervosa. In Handbook of Treatment for Eating Disorders (2nd edn) (eds Garner, D. M. & Garfinkel, P. E.), pp. 278–294. New York: Guilford. Fairburn, C. G. & Beglin, S. J. (1990) Studies of the epidemiology of bulimia nervosa. 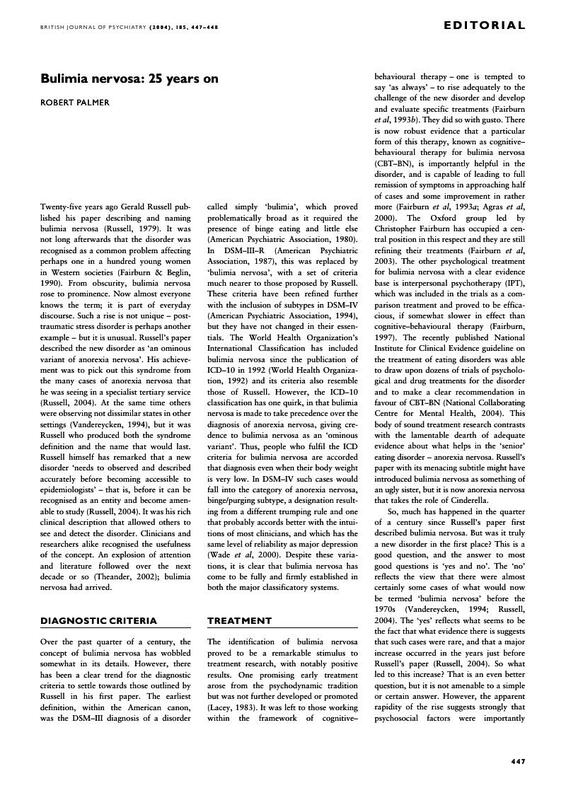 American Journal of Psychiatry, 147, 401–408. Fairburn, C. G. & Harrison, P. J. (2003) Eating disorders. Lancet, 361, 407–416. Fairburn, C. G., Jones, R., Peveler, R. C., et al (1993a) Psychotherapy and bulimia nervosa: the longer-term effects of interpersonal psychotherapy, behavior therapy and cognitive behavior therapy. Archives of General Psychiatry, 50, 419–428. Fairburn, C. G., Marcus, M. D. & Wilson, G. T. (1993b) Cognitive – behavioral therapy for binge eating and bulimia nervosa: a comprehensive treatment manual. In Binge Eating: Nature, Assessment and Treatment (eds Fairburn, C. & Wilson, G. T.), pp. 361–404. New York: Guilford. Fairburn, C. G., Cooper, Z. & Shafran, R. (2003) Cognitive behaviour therapy for eating disorders: a transdiagnostic' theory and treatment. Behaviour Research and Therapy, 41, 509–528. Lacey, J. H. (1983) Bulimia nervosa, binge eating and psychogenic vomiting: a controlled treatment study and long term outcome. BMJ, 286, 1609–1613. Nasser, M. (1997) Culture and Weight Consciousness. London: Routledge. National Collaborating Centre for Mental Health (2004) Eating Disorders: Core Interventions in the Treatment and Management of Anorexia Nervosa, Bulimia Nervosa and Related Eating Disorders. London: British Psychological Society. Palmer, R. L. (1998) Culture, constitution, motivation and the mysterious rise of bulimia nervosa. European Eating Disorders Review, 6, 81–83. Russell, G. F. M. (1979) Bulimia nervosa: an ominous variant of anorexia nervosa. Psychological Medicine, 9, 429–448. Russell, G. F. M. (2004) Thoughts on the 25th anniversary of bulimia nervosa. European Eating Disorders Review, 12, 139–152. Strober, M. & Bulik, C. M. (2002) Genetic epidemiology of eating disorders. In Eating Disorders and Obesity: A Comprehensive Handbook (eds Fairburn, C. G. & Brownell, K. D.). New York: Guilford. Theander, S. (2002) Literature on eating disorders during 40 years: increasing numbers of papers, emergence of bulimia nervosa. European Eating Disorders Review, 10, 386–398. Turner, H. & Bryant-Waugh, R. (2004) Eating disorder not otherwise specified (EDNOS): profiles of clients presenting at a community eating disorders service. European Eating Disorders Review, 12, 18–26. Vandereycken, W. (1994) Emergence of bulimia nervosa as a separate diagnostic entity: review of the literature from 1960 to 1979. International Journal of Eating Disorders, 16, 105–116. Wade, T. D., Bulik, C. M. & Kendler, K. S. (2000) Reliability of lifetime history of bulimia nervosa: comparison with major depression. British Journal of Psychiatry, 177, 72–76.